The role of work is changing fast, for diverse reasons like digitisation, socio-economic forces and the innovative nature of the millennial generation. Attitudes and behaviours of employees are different from ever before, and they will define what the real future of work looks like. The way leaders respond to rising disruption will determine tomorrow's prosperity -- so they need to act now. With so many conflicting takes on the quickly changing workforce, leaders need a way to cut through the noise. 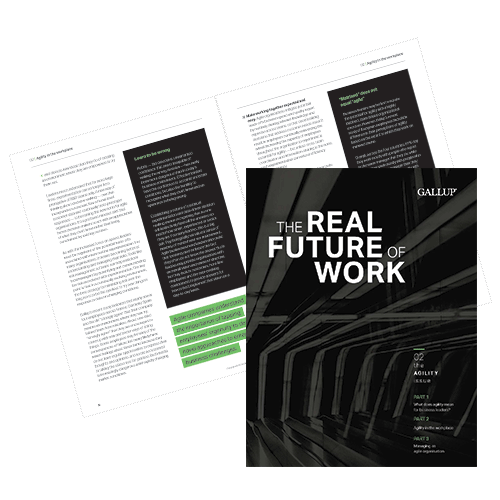 That's why Gallup is bringing you a new regular digital publication that delves into pressing topics facing leaders. We curate the best thinking for you and advise you on how to make changes in your workplace today. Does your approach to ethics meet the demands of current business realities? Do your ethics compliance programs motivate employees to behave in ethical ways? How do you take risks in the AI era? What does agility mean for business leaders in the U.K., France, Spain and Germany? How does working at an agile organisation affect employees? How can you manage an agile organisation? We answer these questions and more in our Agility issue. There's a lot to know about the future of work. That's why we hand-picked the best of the best for you. If you read nothing else today, read this. Making workplace changes shouldn't take a revolution. Gallup can help. Get the best out of your people with our metrics, tools and advice. Discover the best strategies for building an exceptional workplace.